There is no doubt as to the origins of throwing the hammer. Wherever this tool was used - smitheries, quarries, or farms - men diverted themselves by throwing the wooden-shafted sledgehammer. In the past, throwers used to gain distance by spinning around to build up momentum before releasing the hammer. Unfortunately, throwers would lose their grip and send the hammer flying into the crowds often enough that this method was banned. 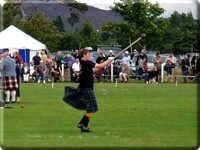 The Scottish hammer toss is today similar to the version seen at modern track-and-field competitions. 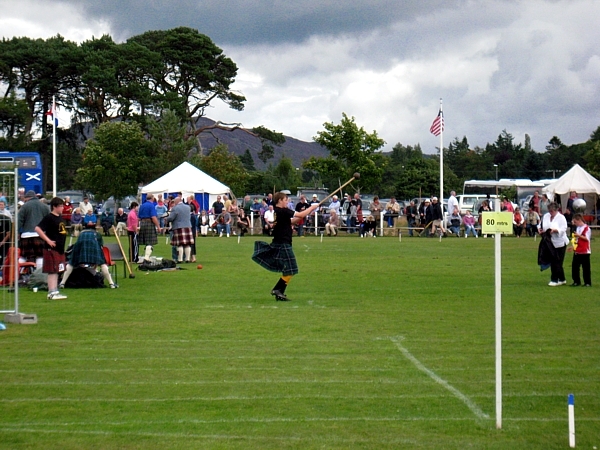 In the Scottish event, men use a round metal ball that weighs between sixteen and twenty-two pounds (while women use one weighing twelve to sixteen pounds) that is attached to the end of a four-foot long shaft made from wood, bamboo, rattan, or plastic. Keeping their feet in fixed positions, the participants whirl the hammers over their heads and throw them for distance over their shoulders. The fact that some record breakers have been short and slight in stature speaks to the fact that balance and timing are more critical components to success than brute strength.